Sign up today to sell at our upcoming event. You can sign up to help as well! Consignors shop early! Gather, prep and price your items. Create your tags using our online tagging system. We have a guide to help with pricing. We've got helpful videos too! Drop off your items at the sale. Track your sales during the event. Pick up any unsold items after the sale or donate them to our charity partners. ...and your check is emailed within two weeks! Our average consignor makes over $400 in sales! Consignors make 60% of their sales, 70% (or more!) if helping at the event minus an $11 consignor fee. Set the price for their items & decide if they are discounted during our half price day. Receive two presale passes to shop before the public. Create and print tags using our FREE on-line bar-coding system. Must have a minimum of $100 worth of items however there is no limit to the number of items you can sell. The online Team Member scheduler will open on Fri., Feb 1 at 9am! We would LOVE to have you join our team of over 300 consignors that help at our event! We offer special “perks” just for our Team Members. shop early at the 50% off presale on Saturday (bring your entire family to our Sale-a-bration (cake & raffles) during this presale. Shifts are available in two and four hour increments. The more hours you help the earlier you get to shop. Team members help with such tasks as event set-up, inspection, floor organization, safety checks, register, and breaking down the event. Please bring your Team Member form with you to your shift. Team Leaders are the First to Shop. 16 hour Team Leaders earn 75% of their items sales and 24 hour Team Leads earn 85%. To apply and learn more CLICK HERE. 7:30pm-8:30pm - Consignors with more than 300 items that would prefer and appt. CLICK HERE to schedule. Note: Consignors with more than 300 non-donated items are REQUIRED to participate in sorting for a minimum of two hours. Failure to fulfill these hours will result in a 10% penalty of sales. These hours do not count towards a higher % of sales. You can schedule your shift through our online scheduler. Pick-up takes 30-60 minutes. Items will be sorted by consignor number. Items not picked up will be donated to our charity partners at 6:31. Consignors will be charged a $10 fee for every 100 items left at the sale but NOT marked for donate due to the time it takes volunteers to sort the items. Due to space constraints, we are unable to allow children under the age of 12 before the Family Shop at 7pm. The only exception is for nursing infants (under 12 months) who can be worn in a carrier or sling. No car seat carriers or strollers before 7pm. We accept seasonally appropriate clothing. (Get a list of what we accept by season here) We accept up to size 14 for boys and girls as well as junior girls. Clothing must be in excellent condition. PRICING - We have a $3 minimum on clothing. If a single, hanging clothing item can't bring $3 on its own, we recommend pairing it with another item to bring the price up to $3. SEE HERE for a pricing guide. HANGERS – All clothing must be hung except onesies & undershirts. We accept all types of hangers (plastic, wire, pant, shirt). Hangers must fit the clothing appropriately. Clothing under size five usually needs to be on child size hangers. Sizes five and up should be on adult size hangers so they don’t end up on the floor. Hangers can be found at stores like Walmart, Target, and Babies R Us, dry cleaners, or through our website. ATTACHING TAGS/HANGING - Clothes must be hung so the hanger looks like a question mark (?) if you are facing it. The tag should be placed on the right hand shoulder/side of the garment or in manufacturers label if attaching it to the garment will damage it. We will not accept clothing with holes due to tagging guns or safety pins. Use tagging guns or large safety pins (not straight pins) to attach tags. Pin clothing sets securely together with pants hung on the backside of the shirt and pinned at the waist on the hanger so that both pieces can be viewed without unpinning them. To view a video on how to hang clothing items CLICK HERE. Maternity clothing must be less than five years old as styles have drastically changed over the last few years. 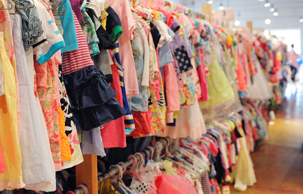 Please refer to the children’s clothing section above for additional clothing guidelines. Seasonally appropriate shoes and boots that are new or look like new. Athletic cleats that are clean and in good condition, even if they show a little wear. PRICING – We do not have a pricing minimum on shoes however we recommend starting at $3.00 for infant/toddler; Add $1 each for larger size, name brand, or heavy/winter. PREPARING - Fasten shoes together with zip ties or ribbons. For infant shoes or small shoes without laces, you may put the shoes in a clear zip-lock bag. We prefer no shoe boxes. However, if shoes are in the box, please remove the lid, secure it to the bottom of the box, and secure the shoes to the box (closed boxes do not sell well). To view our video on how to prepare shoes CLICK HERE. 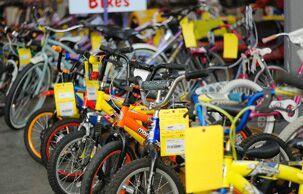 We accept ride-on toys, kitchen sets, block sets, dolls, trucks & cars, outdoor toys, learning toys, and more. Small parts should be bagged and taped to the main part of the item very securely. Use HEAVY packing tape as lighter tape does not always hold. Also, write your consignor # on the bag in case it gets separated from the item. ATTACHING TAGS: Attach JBF tag directly to item with clear packaging tape or hole-punch JBF tag and tie it to item. Do not tape over the barcode as our scanners won’t read them. To view our video on how to prepare toys CLICK HERE. Children's, parenting, homeschooling, pregnancy and child rearing books. Must be free of dirt, marks, dents, etc. Mr. Clean magic erasers work well on removing marks from items. Games and puzzles should have all pieces and be taped closed. Puzzles that are not in boxes should have the pieces in a zip-lock bag. Check all DVDs, computer games, and CDS to make sure the correct disk is included. Use clear self-seal bags or clear cling wrap (saran wrap) to hold multiple items together; Tie sets of books together with ribbon/string. Be sure that parts/games to video game systems (such as Vtech) cannot be separated or switched out at the sale. Do not tape over the barcode when attaching tags as our scanners won’t read them. A note about books: attach your tag to the outside of the book with clear tape or painters tape if clear tape will damage the books. You should price books aggressively as we get a lot of them. ATTACHING TAGS: Bring these items to the sale with the tags detached. The tag will be attached at consignor drop off. We accept pillow cases, sheets, shams and receiving blankets. We do not accept quilts, comforters, crib bumpers and sleeping bags. We also accept towels, washcloths. PREPARING: Put bedding/bedroom sets together in original packaging or in giant clear plastic bags. Arrange bedding sets inside bag so that shoppers can see all of the items as well as the design/pattern. Secure the bag so that items do not get separated. Bundle thinks like towels together with ribbon like a package (be sure multiple pieces cannot be separated). ATTACHING TAGS: If bedding is in a plastic bag, attach tag securely with packaging tape and tape the bag shut (do not tape over the barcode). If items are bundled with string, attach tag directly to blanket and tuck it under the ribbon/string so that it does not easily get pulled off when shifting around during the sale. We accept most accessories (socks, hair accessories, belts, etc.) all year round, if seasonally appropriate. For example: we would not accept winter hats and gloves at or spring sale. PREPARING: Accessories are typically packaged best in zip lock bags. Package things like socks and hair accessories in lots. ATTACHING TAGS: Attach the tag directly to item or clear self-seal bag with clear packaging tape or hole-punch the tag and tie it to item. Do not tape over the barcode. We accept diaper bags nursing covers & pillows, feeding items, monitors, safety items, diapering & toileting items, and more. No time to tag? Let us do it! You will need a consignor number, so if you don’t have one, CLICK HERE. CLICK HERE to request a Valet tagging slot. Once your items have been entered into the tagging website (you will have 24 hours to approve the tags). Your Valet tagger will take your items to the event and place them on the sales floor. A check will be mailed within two weeks of the end of the event. Valet Tagging slots are limited and will be filled on a first come, first served basis. Valet Consignors must consign a minimum of 50 items. All consignors put their items directly onto the sales floor after being checked in. Inspection will take place after consignor drop-off. During inspection, unacceptable items will be pulled from the sales floor. Consignors will be charged .50 for any item pulled from the floor. Consignors will not be charged if it is determined that an item was pulled due to something outside of their control (e.g. item fell on floor during the sale and became dirty). Please know that we do not want to charge consignors for unacceptable items. If you have a question about what we accept please reach out to us at any time prior to the sale. We only have limited number of Express Drop Off slots available - slots are filled first come, first served. CLICK HERE to schedule an appointment.